Guess what! It’s finally SUMMER BREAK!!! Woohoo!! Unfortunately, I haven’t really been able to celebrate (or do very much at all for that matter) because before school ended I managed to contract an illness from one of my students (I assume) and it’s also the reason I wasn’t able to update my blog for so long. Somehow I got hand, foot, and mouth disease which is pretty bizarre because apparently it’s really uncommon for anyone over the age of 10. It started with a really bad fever then followed with blisters all over the palms of my hands, fingers, bottoms of my feet, and toes that itched and burned like crazy. I couldn’t walk or touch anything and the itching made it impossible to sleep at night. The worst was having to grade my final exams while barely being able to grip the pen! I also got the blisters in my mouth so eating and drinking also became difficult. There’s no treatment for it – it just goes away by itself, so I just had to ride it through. I did get some prescription strength Benadryl from the doctor so it knocked me out pretty well at night and I was able to sleep finally. Luckily, I am feeling a lot better today! My hands and feet don’t itch at all (thank God) but the blisters are still there so they are still a little tender and I can’t walk too far. Hopefully I’ll be completely better in a few days. So since I was unable to cook in recent days, today I’m going to recount the meal I made Memorial Day weekend with Dan! The Saturday of Memorial Day weekend I had to be at my school’s graduation to announce the names of my homeroom students who were graduating (I was SO nervous!) so Sunday was my day for fun and relaxation. The weather was absolutely gorgeous so Dan and I spent the day at Colectivo by the Lake and taking a stroll by the Lakefront. It really was a perfect day. When dinner came along we decided we wanted something fresh and a little summery. Dan thought tacos sounded good and I thought why not make our own variation. So we made Chicken Tacos with Black Beans and Mango Salsa. Ummmm they were amazing!!!!!! Delicious, fresh, and summery: just like we wanted. We scarfed these down like crazy – they were so good! I apologize for the pictures by the way. Since we cooked at Dan’s and it was a little spur of the moment, I didn’t have my good camera with me so these were taken on my phone. Okay, here we go! First, get your chicken cooking. Sprinkle 2 large chicken breasts with some salt, pepper, and taco seasoning then saute them in a skillet in some oil. While the chicken is cooking, heat up your black beans on the stove. First drain them well, then add them into a pot with a little bit of water and add some taco seasoning. Turn heat on low and let simmer on the stove till warm. Next, prepare the mango salsa. Peel and dice 1 mango and 1/2 cup cucumber. Finely chop 1 tablespoon jalapeno. Dice 1/3 cup red onion. Mix ingredients together and squeeze in 1 tablespoon lime juice and sprinkle on some salt and pepper. Finally, roughly chop 1/3 cup fresh cilantro leaves and mix into the salsa. Mix everything together well, then set aside. Finally, make the guacamole. You could make a real guacamole, or you could go the easy route like we did! Just mash 2 avocados with a couple squeezes of lime juice, garlic powder, and salt and pepper. When the chicken is cooked, shred it and add a little more taco seasoning if you would like. Line up all your ingredients and enjoy assembling your tacos! We have: flour tortillas (that we heated up in the microwave for 10-15 seconds), shredded chicken, black beans, mango salsa, guacamole, Mexican shredded cheese blend, and Greek yogurt (in place of sour cream). Assemble and enjoy! These were delicious as well as healthy! They also kept us nice and full. I definitely recommend these!!! Season chicken with salt, pepper, and taco seasoning. Cook in a skillet on medium-high heat. Drain 1 can black beans then add into a sauce pan with a splash of water and taco seasoning and heat on low until warm. 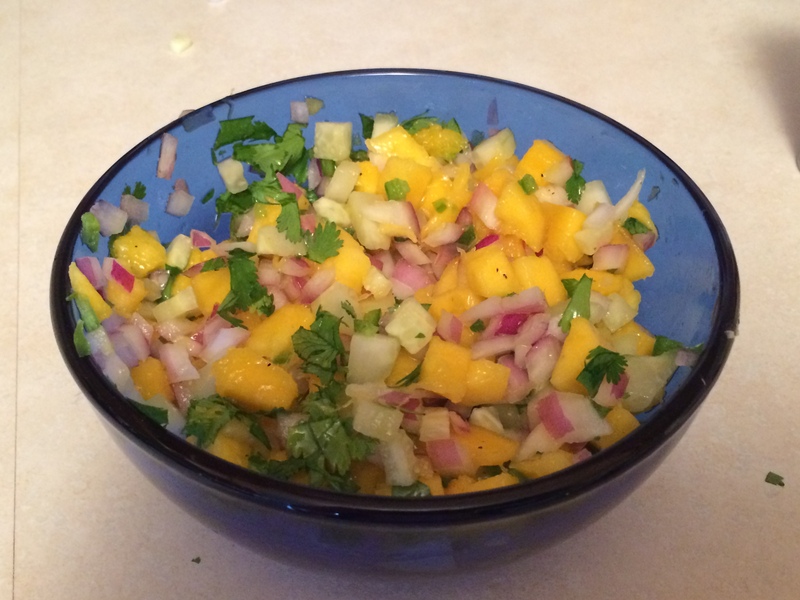 Mango salsa: combine all ingredients and mix well. Guacamole: mash 2 avocados with lime, garlic powder, and salt and pepper. Shred chicken when it’s done cooking and add more taco seasoning if needed. Set all ingredients out for tacos: flour tortillas (heated in microwave), chicken, black beans, mango salsa, guacamole, Greek yogurt, and cheese blend. Assemble tacos and enjoy! This entry was posted in Dinner, Healthy, Lunch, Mexican and tagged black beans, guacamole, healthy, mango salsa, shredded chicken, summer, tacos. Bookmark the permalink.